So my addiction for One Piece just keeps getting more and more insane. I just recently got my hands on these figurines and I took the chance to mess around with some of them and put some story into each scene as well. In the anime I’m currently already at the tail end of Thriller Bark or as they say it in the show, “Sriller Barks”. I’m pretty pumped since Mr. Monkey D. Luffy already has his full crew and I’m starting to appreciate the toys since I know who they are now. This set of toys were purchased as a set and although the characters were random, I still had fun taking shots and making up storyline conversations between them. (Yes, I’m childish like that). From Left to Right the guys I got were Sanji, Shanks, Tony Chopper, Mihawk Hawk Eyes, Roronoa Zoro, Portgas D. Ace, then of course, Monkey D. Luffy. First is a shot of the crew planning their next adventure. 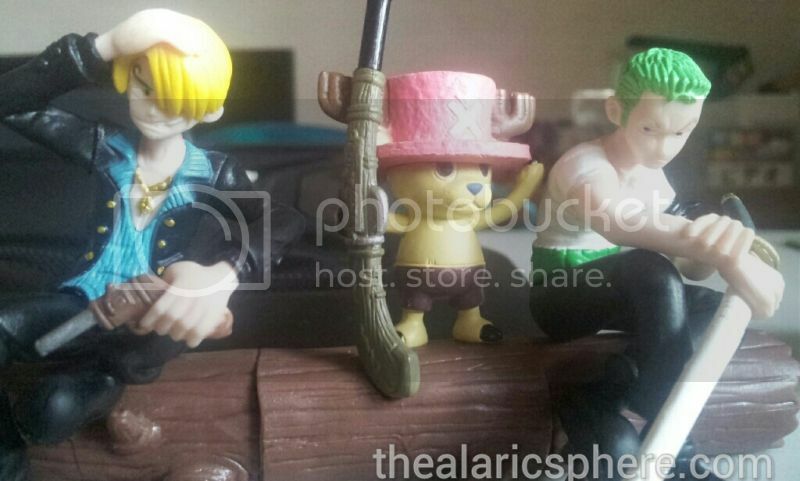 Sanji and Zoro still can’t get along. Chopper is excited anyway while Nami and Usopp are probably preparing some of their supplies. Zoro is still pissed at the love cook for goofing off during their hunting trip while Luffy just entertains himself by watching them yap off. 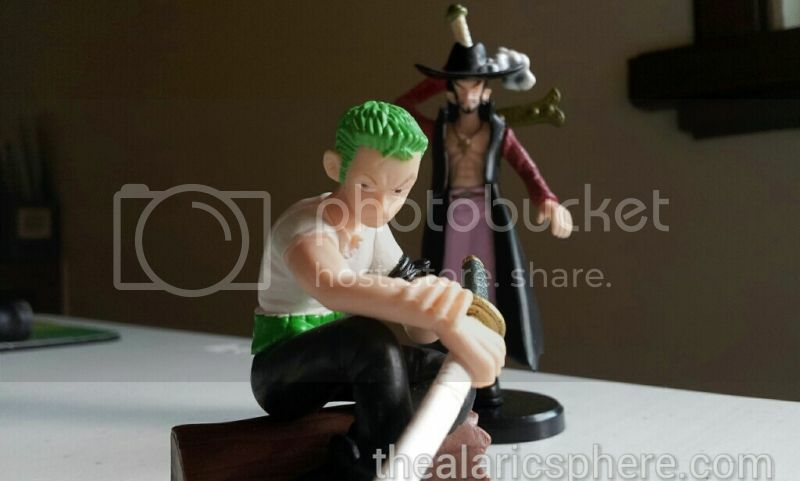 Next up we have Zoro focusing on his inner drive to become the best swordsman ever. He is haunted by the memory of his lopsided defeat at the hands of Mihawk back in East Blue. He has gotten stronger since then, but is it enough to win against Mihawk? 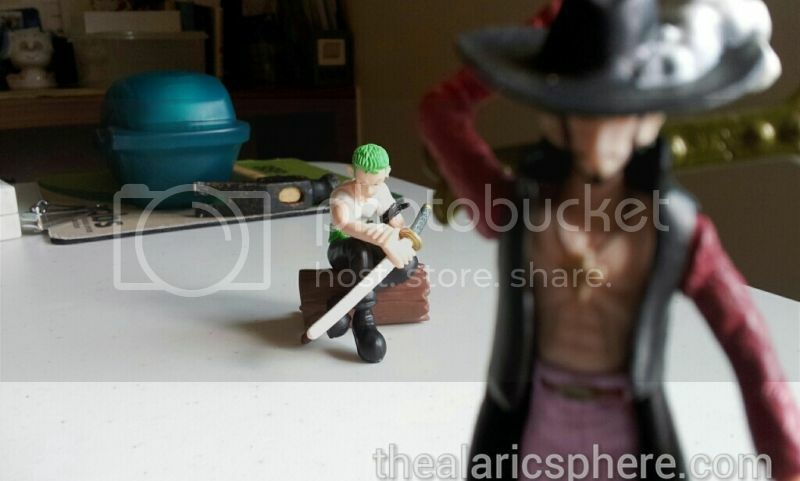 Mihawk continues to torment Zoro in his dreams. 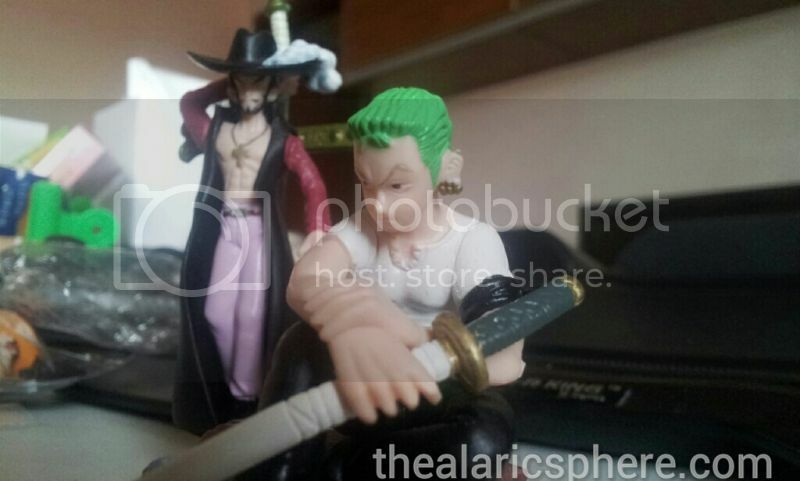 Mihawk eagerly awaits Zoro to surpass him and give him an awesome battle. 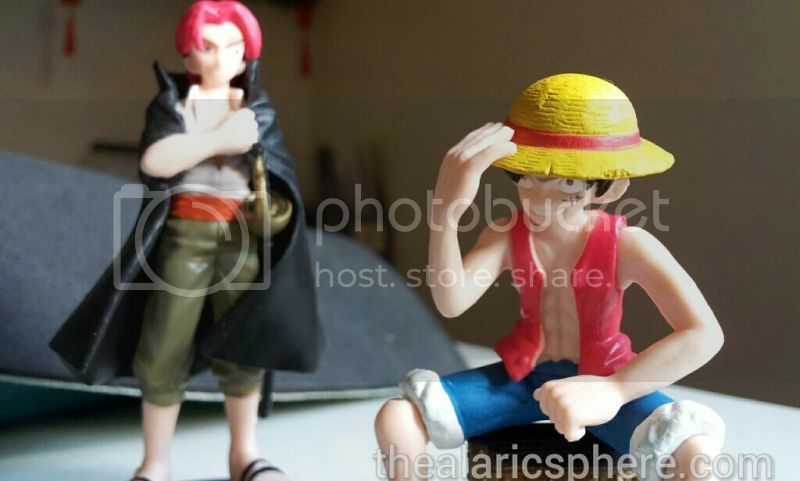 Shanks and Luffy meet up once again years after their last encounter. Shanks is proud of what Luffy has become in that he is living his dream of becoming a pirate and surpassing Shanks. 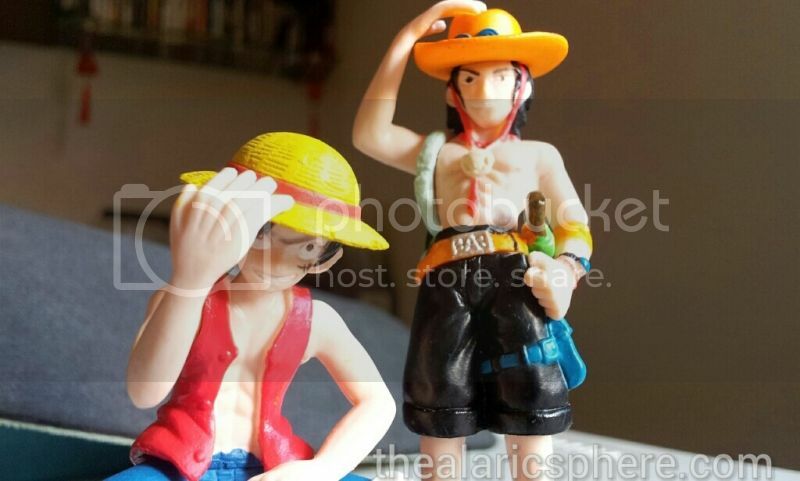 Luffy and Ace pose for the camera. Ace is using his fire technique so they need to hold on to their hats so they don’t fly off. So there you have it. 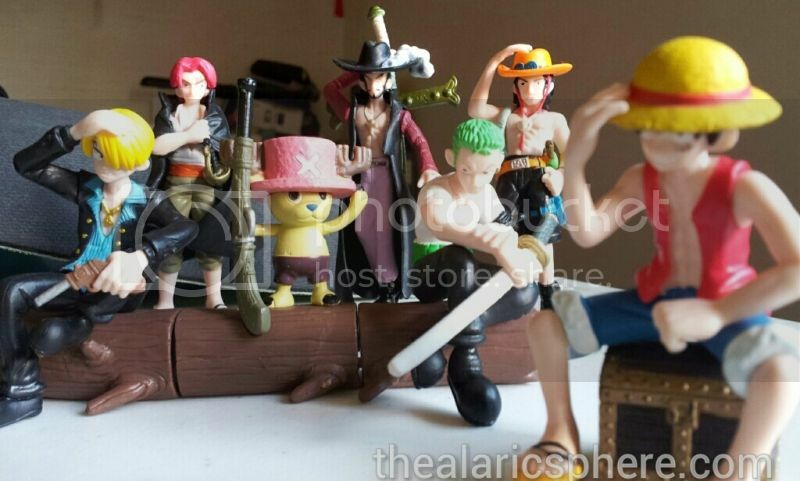 One Piece toy madness. I have placed an order for the whole crew which I’ll probably get sometime in June. I’ll probably come up with better storylines once I get those that can actually move their arms and legs. Fun times!